At many of the subway stations commuters were exposed to peak noise levels that far exceeded acceptable levels. Most of us who live in a large city would probably agree that our daily surroundings are noisy and are, annoyingly, a constant presence in our lives. But we might not all know that recent studies in major areas of the U.S. such as NYC, demonstrate how this type of noise poses a major public health risk. Growing evidence shows that hearing loss may lead to chronic health conditions such as hypertension or heart disease; it can lead to more aggressive behavior as well as increased stress and fatigue. Our research group investigated the effects of long-term noise exposure to one’s overall hearing health by sampling the amount of noise exposure in the Canadian municipal transit system, a service widely used by commuters. Using a personal noise dosimeter, we systematically measured public noise levels of different modes of transportation: subway, bus and streetcar platforms including in-vehicle noise. We also measured private noise levels for commuters who drove a car, biked, or walked. At many of the subway stations and transit vehicles, people using any public or private mode of transportation were exposed to peak noise levels that far exceeded acceptable levels. Our team took hundreds of measurements all over Toronto, and the results were rather surprising. We found that the average amount of noise exposure, when considered with the average commute time, was within recommended levels. 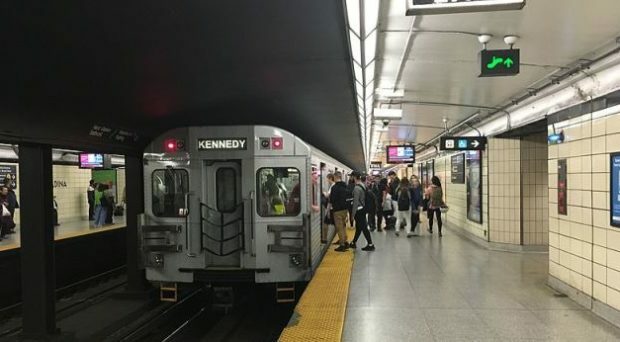 However, at many of the subway stations and transit vehicles, people using any public or private mode of transportation were exposed to peak noise levels that far exceeded acceptable levels. Short loud bursts of noise can actually be more damaging to your hearing than long, softer durations of noise. This mechanism of damage is similar to that of soldiers or recreational hunters who are exposed to weaponry or combat noise. In most cases, our ears have a beautiful reflexive mechanism to help protect us from loud noise called the stapedial reflex, in which the smallest striated muscle in your body tenses up to stiffen up the little bones in the middle ear (ossicles) that transmit sound to our inner ear (cochlea). This stiffening dampens the amount of sound that enters our sensitive inner ear and protects the hair cells that convert sound energy to nerve impulses. However, the sudden nature of loud bursts of noise, such as the screeching of subway cars and buses, do not allow our ears enough time to deploy this protective mechanism, leading to permanent hearing loss. Frustratingly, hearing loss affects 32 million children, but 60% of those children with hearing loss had preventable causes. This doesn’t take into account the 320+ million adults that are also affected by hearing loss, who are now more prone to a host of health issues such as depression, anxiety, and other degenerative conditions such as dementia. Mass transit systems are a necessary part of every large metropolitan city worldwide, and this study aims to be an important reminder that city planners, engineers, and everyday citizens need to speak up and prioritize noise pollution as our public transit systems continue to expand in response to demand. This study also highlights the need to consider noise pollution in many other facets of our daily lives like road noise, recreational activities and personal noise exposure via headphones and music devices. There are many solutions to help reduce noise pollution, but until we make it a major policy issue, it will continue to be neglected: exacerbating the dangers that affect our long-term hearing and health. Dr. Vincent Lin is an otolaryngologist – head & neck surgeon with a subspecialty interest in diseases of hearing and balance. He completed otolaryngology – head & neck surgical residency at the University of Toronto. He continued his training with an advanced otology – neurotology skull base fellow at Sunnybrook Health Sciences Centre and then a further research fellowship at the Virginia Merrill Bloedel Hearing Regeneration Centre at the University of Washington. His research interests include both hearing loss prevention, cochlear implantation and inner ear pharmacology. He is currently an Associate Professor and Associate Scientist at Sunnybrook Health Sciences Centre and the University of Toronto.